Zoiks! What a great weekend for climbing, hiking and general carousing with friends in the mountains! With an early morning wake up call, I was questioning if my extra beer the night before was a wise decision. But as 4:30 AM hit and we were leaving Ben’s driveway before the sun was coming up, I was feeling good about the day’s prospects. We pulled into the parking lot a little after 6:00 and were heading up Tuckerman Ravine Trail as the sun’s rays were starting to hit the mountain above us. Our target: the Lion Head Trail. The Tuckerman Ravine Trail is essentially a “grind”. It is 2.4 miles and 1800′ of gain and is very wide – it is routinely patrolled by Forest Service Rangers on snowmobiles and has a snowcat that travels back and forth on some of the trails in the area. Being mindful of our set turn back time of 10:00 AM we wanted to boogie and made it up the 1.75 miles to the Lion Head Trail in an hour, which was a great pace for hiking up. After a brief turn off to get to the foot of the rise, the real fun began. Lion Head is the steepest hiking I have ever done*. The winter route is set up because the summer route is too prone to avalanches during the winter. And the winter route is closed during the summer route because it is too steep with out the snow to fill it in. Luckily Ben had his ice axe with him and let me use that as we went up to gain experience with it. We made okay time going up, it was slow, but steady and very, very tiring. My arm was exhausted from swinging the axe into the snow pack and my legs were exhausted from kicking in with my crampons. Realizing that the way down would be very slow going becuase the snow was so soft and we only had the one ice axe; we adjusted our turn back time to 9:30 to allow for more time to get back down. After a short break to fuel up and hydrate we started to make our way down. I would like to say slowly. But an ill fated attempt at trying a “short slide” turned into an on-the-edge-of-out-of-control plummet until I was able to latch onto a tree, avoid the bouncing ice axe, and stop my self from sliding off the edge of the trail. It was probably the most terrifying 2.8 seconds I have ever encountered! After looking up and clearing the snow from my face and sunglasses, I gave Ben the quick thumbs up that I was okay and offered up that he not take that approach. From that point until the base of the cliff face, we decided we would down climb. Down climbing is essentially like going down a ladder. You face the mountain and hike down backwards. I would drive the ice ax into snow with my right arm; reach down with my left leg and kick in a foot hold; my right foot would go next; and my left hand would punch a hole in the snow or grab onto a tree or root for support. On and on we went down the face of the trail. If I weren’t so focused on finding safe foot placements, I probably would have been a little more petrified. But by taking it easy, taking one step at a time, and taking multiple breaks to assess where I was going made it that much easier to move on. Once we got off the really steep part, the fun began. The lower part of the trail descends at a pretty good grade but not nearly as vertical as the higher section. Translation: perfect for sliding! This time, the slide was three times as long and many times safer, but still just as fast. I again blew by my anticipated stopping point, swerved around an s-curve of trees and continued down the path. It was quite the ride! Once we got back down to the Tuckerman Ravine Trail we moved pretty quickly getting back down to the lodge a little after noon time passing many skiers who were making their way towards Tuckerman for their own adventure. Overall, for my first real tough winter climbing experience, I could not have been happier. A little fun, a little adventure, perfect weather – low winds and few clouds were seen anywhere – made for an excellent adventure. We didn’t make it to the top of Lion Head but overall, the goal was to get out there on the trail and get me some experience on some tougher hiking trails. After lunch, we repacked our packs to get ready for the overnight on Doublehead and made our way on over that mountain for an afternoon hike an evening birthday soiree. It was a perfect start to the weekend with great weather, great hiking and many lessons learned! *as we had stopped at the base of the steep sections, we were surprised by a hiker coming down who had spent dawn up at the summit. Looking mildly like a meth head he described his hike down by saying “I am going down to the lodge to change my diaper”. Add that to the list of things you don’t want to hear right before attempting what you know is your most challenging hike ever. This entry was posted in Hikes, Training and tagged Hiking, Lion Head Trail, Mt. 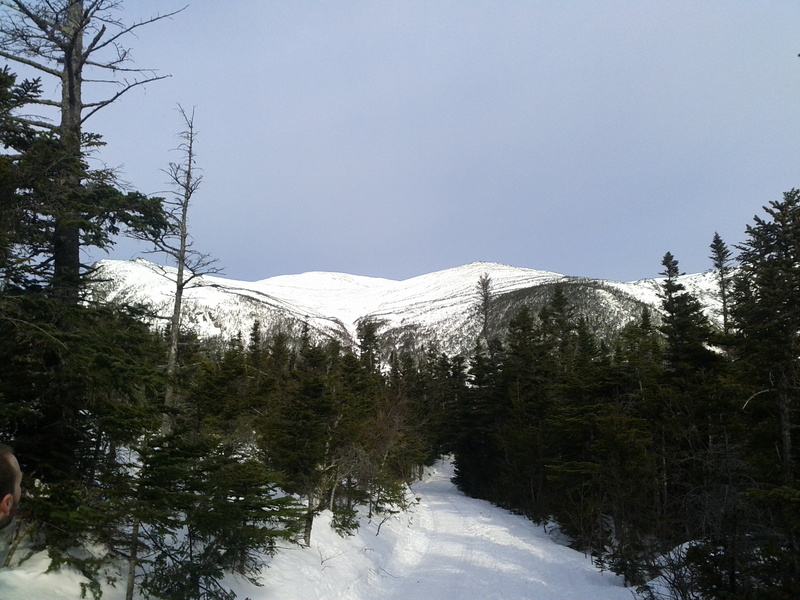 Washington, Pinkham Notch, Presidential Range, Tuckerman Ravine, Winter Hiking. Bookmark the permalink.